Commonly termed environmental review, National Environmental Policy Act (NEPA) and similar legislation enacted in several states has had complex and far-reaching effects on the governmental approval of proposed projects subject to NEPA and related rules. Recognition and understanding of the proposed project action in the context of the environmental review process and environmental permitting requirements is vital to developing realistic environmental review timeframes and anticipated costs. Braun Intertec staff has extensive experience in completing environmental review projects at all levels and under the rules of a wide variety of federal and state entities. Whether a proposed project must undergo environmental review due to federal and/or state rules, Braun Intertec can effectively guide you through the process. Increasing pressure on water resources has emphasized the importance of understanding and delineating the supply characteristics and sustainability of groundwater systems and their interrelationships with surface water resources. The use and distribution of these water resources varies from state to state with widely varying laws determining priority of usage. These laws may or may not govern the distribution of reclaimed wastewaters or their re-use, potentially creating new water supplies in areas of fully subscribed usage. 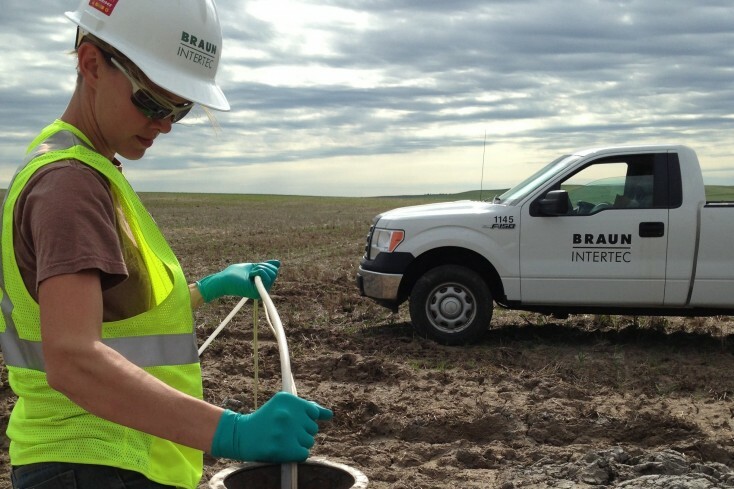 Braun Intertec scientists have extensive experience in delineating and quantifying the yield characteristics and sustainability of groundwater supplies and are especially skilled in locating and developing localized glacial drift aquifers. An outcome of the Federal Clean Water Act, stormwater regulations are always changing and are widely expected to become even more restrictive over time. Braun Intertec has the expertise and knowledge to help you comply with the permit program and minimize stormwater pollutant discharges. Whether your work involves construction or industrial stormwater permits and associated plans, Braun Intertec has stormwater pollution prevention designers and inspectors to select effective best management practices (BMP), review BMPs installed by others, or train your staff on the appropriate and optimized use of BMPs. Wetland and waterbodies are protected under federal statutes, including the Clean Water Act and Rivers and Harbors Act. Many states also regulate wetlands through state statutes and through delegation from the federal government. Braun Intertec staff are experienced with determination of jurisdictional wetlands and waters following methods of the 1987 Wetland Delineation Manual, Regional Wetland Delineation Manuals, and state guidelines to characterize soils, vegetation, and hydrology. If permits are required, we can guide you through the process, consult with regulatory agencies, and prepare permit applications for Nationwide Permits, General Permits, Individual Permits, and state permits. Our staff is experienced with unusual and challenging situations including seasonal wetlands, partially drained wetlands, and rare natural wetland communities such as calcareous fens and ephemeral pools. Our staff have conducted wetland projects in numerous states, involving: wetland delineation; Section 404 wetland permitting; Section 10 navigable water permitting; state permitting; consultation with regulatory agencies; mitigation, restoration, and monitoring; wetland banking; functional assessment; GIS analysis and mapping; and environmental review documents. The presence of threatened or endangered species can vary from site to site. Individual plant and animal species may be protected by state and/or federal laws such as the Endangered Species Act, the Migratory Bird Treaty Act, the Bald and Golden Eagle Protection Act, and state endangered species regulations. Braun Intertec has experience working with regulatory agencies to determine potential species occurrences, develop study plans, and conduct field surveys to locate and quantify protected species. Our experts can help you navigate the following areas: habitat evaluation, botanical surveys and vegetation ecology, “take” permit preparation, Habitat Conservation Plans, agency consultation, mitigation, and monitoring.